With the availability of AMD's new lineup of APUs MSI, the world leader in extreme performance mainboards and graphics cards, is pleased to announce the availability of a new lineup of Socket FM2 mainboards. Amongst the models available are the full-fledged FM2-A85X-G65 Gaming mainboard, compact MicroATX models and a brilliant miniITX model with Wi-Fi and Bluetooth. Aiming to deliver the best gaming performance you will find the FM2-A85XA-G65 equipped with an amazing feature set to deliver an unprecedented gaming experience for the AMD platform. OC Genie II boosts the APUs CPU & GPU performance, Memory performance is enhanced with support for both AMP and XMP memory overclocking profiles. And MSI clock generator allows for much faster bus speeds which increases the performance of Dual Graphics and CrossFire even further! This is topped off with the first DigitALL PWM with Military Class III on a MSI mainboard. The FM2-A85X-G65 is truly optimized to deliver the best gaming experience for integrated graphics. There's a Gaming Device Port with enhanced polling for gaming mice/keyboards. OC Genie II boosts both the CPU & GPU performance of the APU. both AMP and XMP memory profiles are supported for easy memory overclocking. Both Dual Graphics and CrossFire are supported to give the best flexibility and performance when it comes to graphics cards. and lastly, there's a dedicated clock generator allowing even more performance than a regular FM2 platform. MSI's FM2 models are available in the most popular formats, ATX, MicroATX and MiniITX. The ATX sized FM2-A85X-G65 is the full-featured gaming mainboard. Those who prefer size go for the FM2-A75IA-E53 which is a flexible solution for those looking to connect their eintire digital home, in one small package. Two MicroATX models, the FM2-A55M and FM2-A75MA-E35 balance features and size for the FM2 platform. 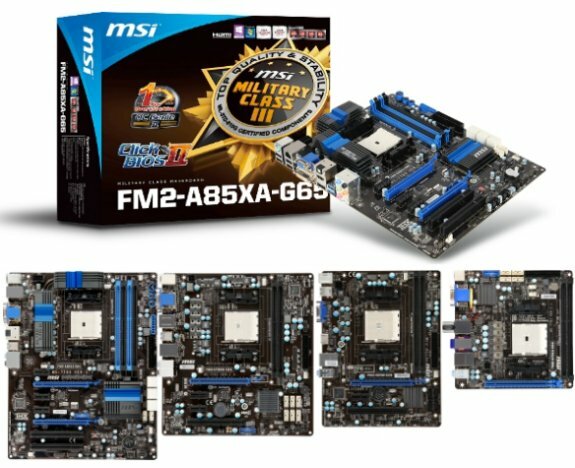 MSI's FM2 mainboards are Windows 8 compatible and support all the features of the upcoming OS. That is why you'll see options like Secure Boot on MSI's FM2 offerings.This reduces the boot times of an already fast system by 32%. Between pushing the power button and working in windows are just six seconds. Another popular MSI feature is introduced for the FM2 platform, this is GO2BIOS which allows you to boot directly into the UEFI BIOS from within windows.